Lately I have been watching Alton Brown’s Good Eats Reloaded. Alton has been going over old episodes of Good Eats and making changes to the show. Sometimes it’s a recipe that is re-worked, a brand new recipe, or just some new piece of information. 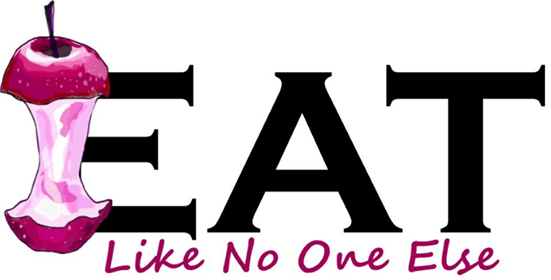 So why not do some Eat Like No One Else Reloaded? I have some posts that have been out on the internet for quite some time. Case in point this post you are reading here, originally published all the way back on October 29, 2009. Note all the original text is in quotes. Like a lot of people I pass by the T-bones, Porterhouses, and Ribeyes of the world because I just can’t afford to buy them. But I still want to have a good steak. So what do I do? I reach for the Chuck Eye Steak. We had less income then, so I for sure wasn’t buying T-Bones and Porterhouse steaks. Now the reason I don’t buy them is that I have several more mouths to feed! Now normally you hear about chuck eye being used as pot roast and the roast from chuck section of the cow, makes the perfect pot roast. Butchers also cut steaks from the chuck. How can they be any good you ask? You cook a pot roast for hours and now you are saying I should cook a steak from the same part of the cow for a minutes on the grill. You might think that I am out of my mind. But I have discovered a technique that makes the chuck eye steak worthwhile to eat. Now I have found a new way that wasn’t available yet in 2009 or at least I had no clue it exists – more on that in a moment. First you need to select your steak. Often I am able to find them on sale for less than $3 a pound. I haven’t seen them on sale for that price in a while. At least a dollar more per pound now is what I find. 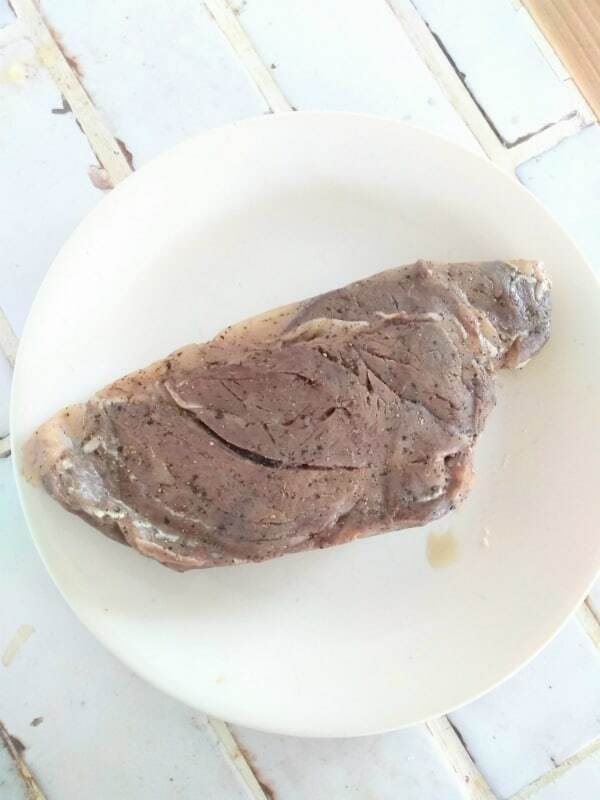 This is a center cut Chuck Eye steak. 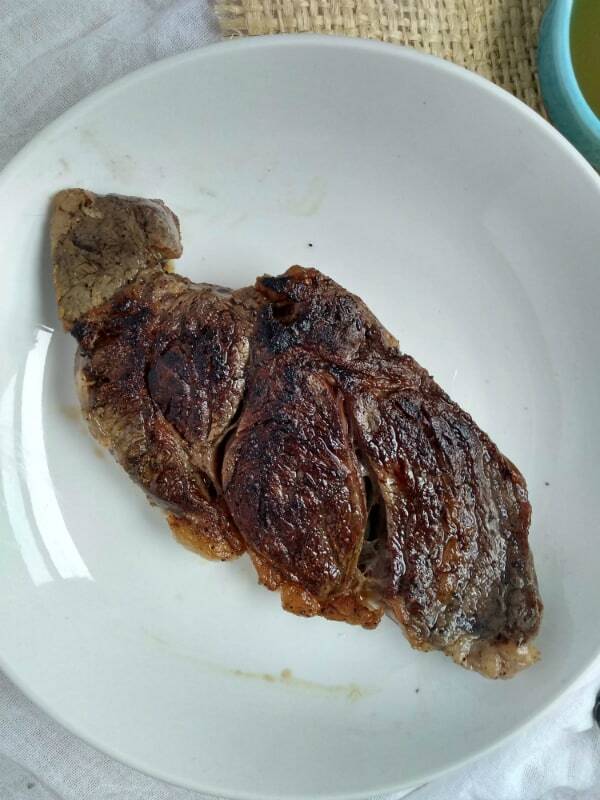 It’s what I get when I buy a Chuck Eye steak. You don’t have as much meat that you can’t eat. If you can, try to find ones that say center eye or center cut. 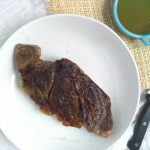 They are usually a little more expensive than just the standard chuck eye steak, but I find that you end up throwing out a lot of fat and grizzle, so the slightly more expensive cut is a similar value. I know that looks like a lot of salt but more of it is coming off before cooking. Second, once you have your steak home, get it out an hour before cooking. Third, and this is the most important step, dump kosher salt (don’t even think of using table salt) all over the meat. Cover both sides with so much salt that you can hardly see any red. Won’t this make your steak super salty? No. No, I really do mean that! It won’t be too salty. What you are doing here is drawing moisture to the surface, which will help give your steak a nice sear. Then through the process of omosis, some of the water will go back into the meat and take along with it the salt which will do two things: flavor the meat and break down the proteins. 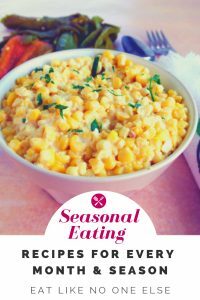 You can also add other seasonings of your choice that will be taken along with the salt. I crack black peppercorns onto the steak when I add the salt. That’s all it needs. After about 45 mins or so depending on how thick your steak is, wash off all the salt and pat the steak dry with a paper towel. You will notice that the steak is now much more likely to fall apart in your hands. I don’t wash all off the steak anymore. I don’t want to add water to it. I simply rub it off with a towel or my hands. 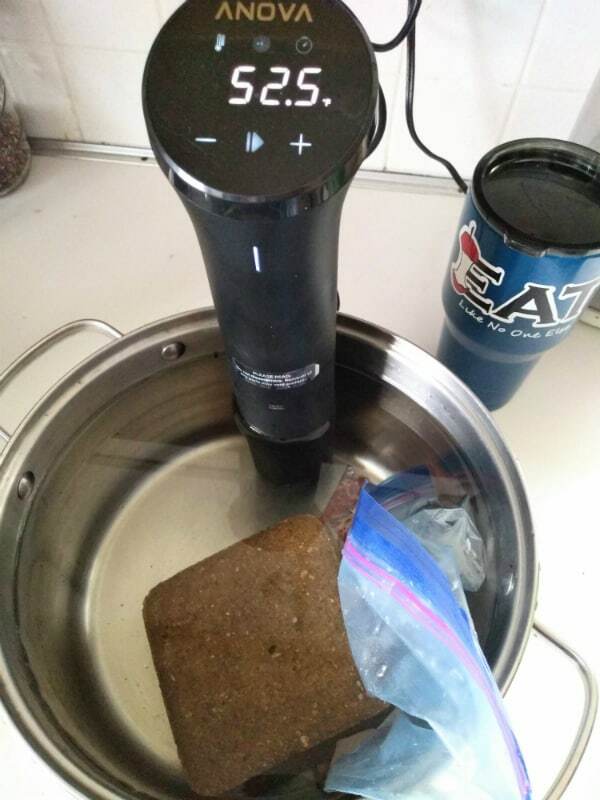 The steak is in it’s bath, ready for the Anova sous vide cooker to be turned on via Bluetooth. The brick is needed to make sure the steak stays underwater. Even though its seal up good enough for no water to get in, sometimes you still get a floater on your hands. I promised you a new method that wasn’t available in 2009, well here is. This past Christmas I got a Anova Sous Vide Precision Nano Cooker. What I like about Sous Vide cooking is that you can hit that perfect temperature, ever time. For a steak it’s even better. You can look up exactly what temperature you want the steak done to. Want medium, set the sous vide to 140 degrees. Medium rare more your thing? Go for 135 degrees. The steak will reach exactly 140 degrees in the water bath and not exceed it. The steak cannot go higher in temperature than the water itself. When the steak first come out of the sous vide is ready to go inside. Outside its drab – almost gray. It needs to be seared. Then a sear in a hot cast iron pan for about a minute per side will make you the perfectly cooked steak. Now, isn’t that a lot better. Still perfect inside. You know how when you cook a steak you sometimes only get a small amount of red or pink in the center? Well with this method you get pink or red throughout. The only part that isn’t is the outer crust. How is that for perfect! Look at all that pink in the middle! I hope you enjoyed this “reloaded post” If you don’t have a sous vide cooker yet, I do think they are worth it That steak I had was so good. Cooked to perfection, mosit, and a melt in your mouth texture. Best chuck eye steak I have ever had. You can just cook the steak on a grill or indoors in a cast iron pan. 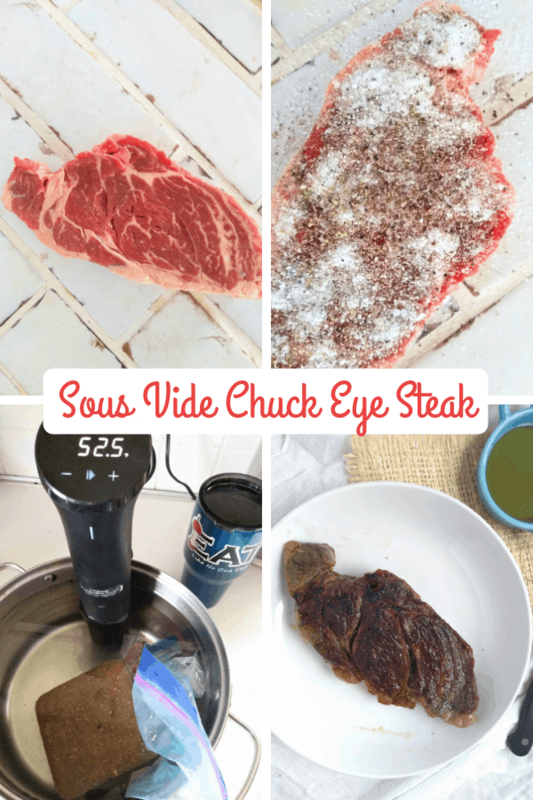 How to cook a delicious chuck eye steak with a sous vide cooker. 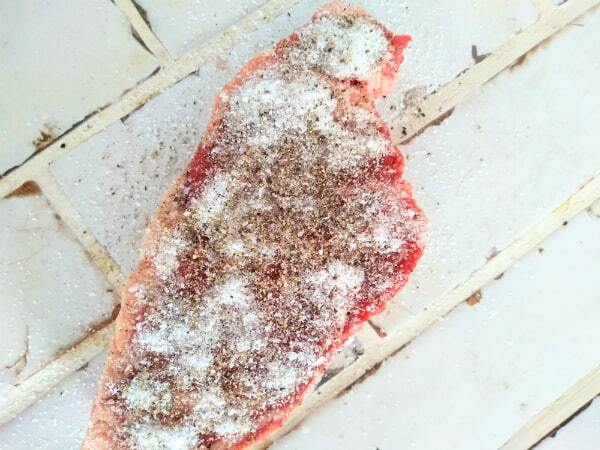 Liberally sprinkle kosher salt all over each side of the steak, so that you can barely see any red. Crank on lots of freshly cracker black pepper as well. Allow steak to sit at room temperature for 30 t0 45 minutes. Rub and shake off all the excess salt and pepper. Place into a vacuum sealed bag. Set your sous vide to 138 for right in between medium rare and medium. You can set it to whatever temperature you want depending on how you like your steak. Add your steaks. If they float then use a brick or heavy weight to keep the under the water. When the timer goes off, remove the steak. Allow to cool for 5 minutes before removing from the bag. Heat a cast iron pan over medium high heat. Coat with cooking oil. Cook the steak, 1 minute per side or until browned, Flip and repeat. Rest steak for 3-5 minutes before cutting into. 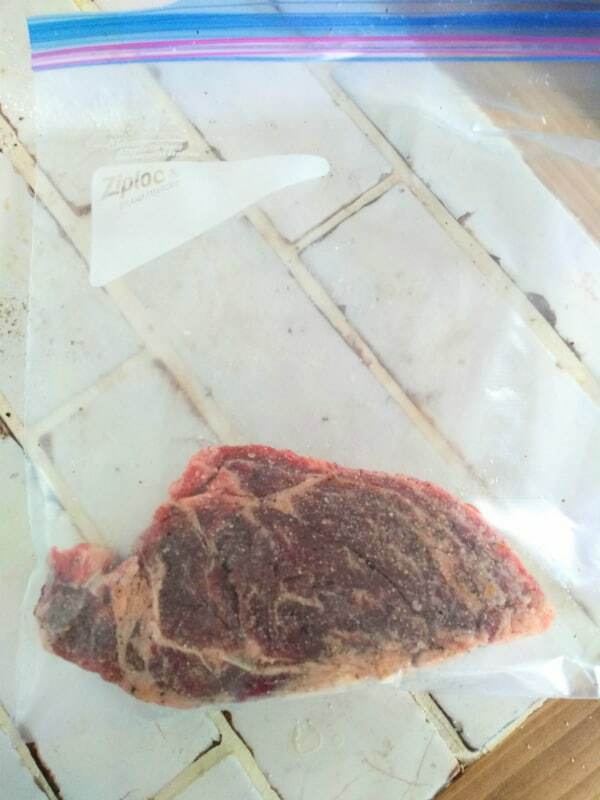 Ziploc Freezer Bags are a cheap way to cook meat with your sous vide cooker. Previous Post: « What are Lucy Glo Apples? Thanks for the tip. I will be trying this! I have always used kosher salt. Maybe because of the different structure of the salt crystals in the sea salt caused it to be too salty. 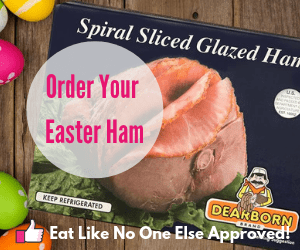 You could always try it again with sea salt but use less of it or try it with kosher. Thanks for sharing your experience. Hmmmm, I am not sure the answer to that. It’s possible that the roast contains the center eye, but I am not 100% sure. 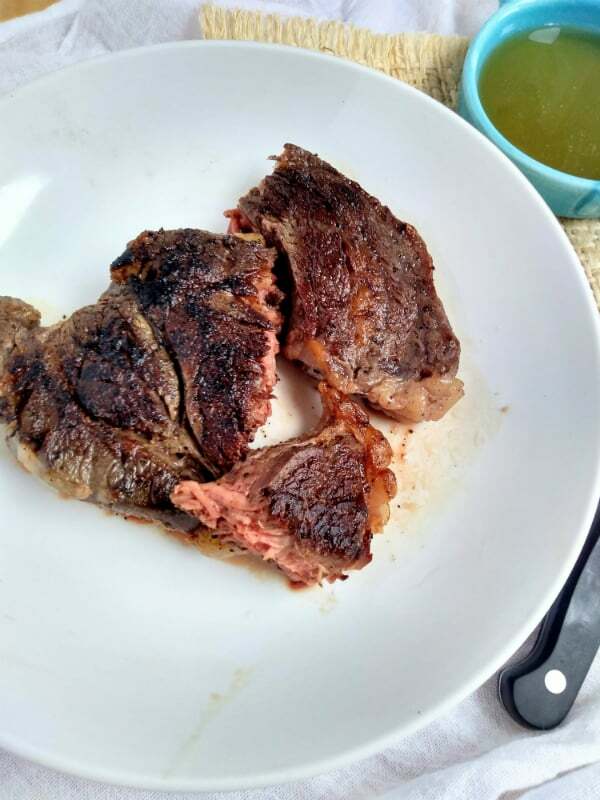 The reason I have purchased the center eye is that I find with just a regular chuck eye steak you end up with some meat on it that is a bit too tough to eat because of all the connective tissue that doesn’t get broken down when you grill it. In my stores the chuck eye steak and roast are often on sale for the same price. Is that the case at your store? 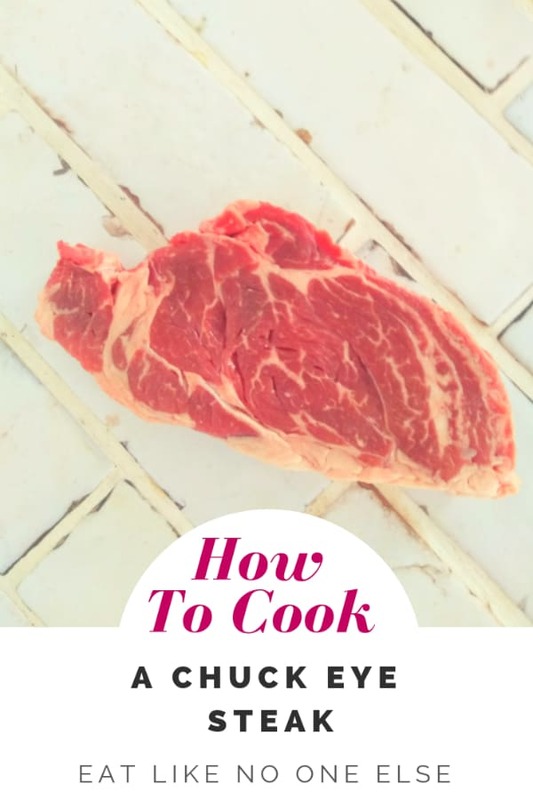 One idea might be to buy a regular chuck eye steak, cut out the center eye section, grill that and save the rest for a long cooking method like a braise or for pot roast. Really you are paying more money for the butcher to cut out the center eye for you. Thanks for your comments, I got me thinking! 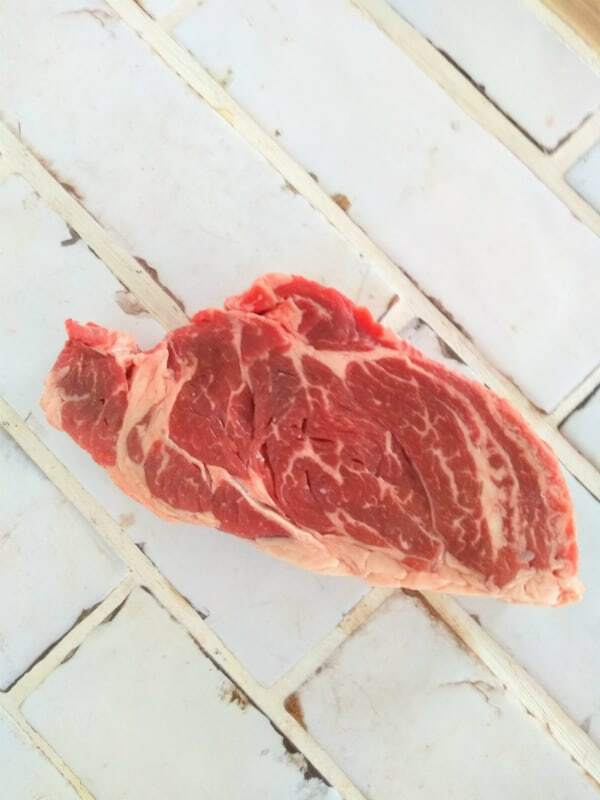 when buying a chuck roast for 249 a pound cut the chuck eye out of it which normally sells for 369 and up and use for grilling and have the reat made into hamburger…..what a cheap good steak and great ground chuck.. don:t get any better than that. Followed directions and it completely ruined the steaks. Tasted like I was eating a spoonful of salt with steak sauce in it. Native Americans used this method to dry and preserve meat, not what I was trying to accomplish. Marinate them in anything and grill BOOM! Sorry it didn’t work out for you. I have never had the problem with the steak beings too salty. I absolutely loved the recipe my husband said it’s the best steak he as ever had. It was very tender and flavorful. Thank you so much I had completely lost my touch for cooking steak tender. Thank you for spreading the word of how good chuck-eye steak can be. Just one thing tho, I’ve used table salt when I’ve been out of kosher salt and the finished product didn’t suffer because of it. Hey guy’s, someone was asking about how to get chuckeye steaks from the roast. If chuck roast go on sale, look for the roast that has the chuckeye in it. If you look at the big round topside you will see the chuckeye steak on the other bottom side. You can tell its a chuckeye steak, just get the biggest chuck roast you can find. When you get home, you can just peel the chuckeye right out of the chuck. It has a fat seam that runs around the chuck steak itself. If you get confused, ask the butcher to show you which chuck roast has the biggest chuckeye and to show you where the fat seam is. Most do not cut beef any longer, most sell that nasty pre packaged stuff that I wouldn’t eat in a million years. Washington Post came out with an article about this and said there was just a small amount of carbon monoxide in the package. Surgeon general said there wasn’t enough of it to hurt you………….. since when is just a small amount “safe” ????? Anyhow, Food Lion still cuts beef, and just a few others, it’s the “only” place I will buy my beef from. Lowes Foods and Wally World along with the rest sell that nasty pre-packaged stuff, NO THANKS! Anyhow, hope this helps some of you out. Good call! I’d never had this cut before today. It was incredible. I’ve now read that you can buy the whole chuck roast at chuck roast prices, cut off the chuck eye steak, and grind the rest for hamburger. That gives you a great steak for maybe $3 per pound. I don’t know why those people had a problem with the salt. Maybe they didn’t wash it off well enough. One of the things I do when a steak like this gets too tender to grill is put a wooden skewer through it to hold it together for flipping. You can’t go wrong with this steak! I usually let them set and get close to room temp before cooking. I usually apply kosher salt 30 min. before grilling, I sear the begeez out of one side and the turn the grill down and flip them, there’s enuff heat to sear the other side but not over cook ’em. I end up with a nice medium-rare feast for the taste buds. I usually can find them well marbled and the fat breaks down and gives them that rich buttery taste and the edges get charred just right. Dang, I’m hungry now. I’m afraid if they get too popular the price will start going up. Hopefully not too many people see this. Thanks for sharing your experience. It is a good steak indeed. I wouldn’t worry about the price going up on them, there is plenty of meat available in that cut. This actually isn’t his recipe, I was just inspired by his show to fix up some of my old recipes and make them better!